It’s beautiful!! You guys all did such a great job on it… Thank you so much again for everything! You have my highest recommendation! Thank you so much for your help today. I really appreciate it. And I love the personal touches your business does. It was a pleasure that you remembered us, our ketubah and our wedding date. WOW! That is all I can say. I am stunned. We placed the order yesterday morning…and it was created and shipped out the same day. And will arrive today. I cannot believe it!.. You guys are magicians! 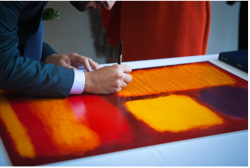 Wedding Video as a Music Video: Our Ketubah is Featured! We’re huge fans of Jacqueline Graben & Alex Hoffman. At first, they were a couple that we got along with well, and we created a ketubah for them that, in the end, turned out to be fantastic (of course, we’re very biased!). Another Ketubah Hit — Yay! But then. After their wedding, Jacqui sent us an email with a first take from their video team for the wedding video. We all watched it together in our studio and… our hearts fell to the floor. Yes–we are completely and utterly cheesy and we fall for it. But it was just so heart warming, every aspect of it: their love story; the ups and downs of the week when Alex proposed–even the tiny little details (she fell for him before she met him… when she saw the photo of his dog!!!!). Their love shines through. But it gets better. The video itself was done incredibly. And I’m not a person that says that easily; I’m usually an annoying guy with annoyingly high standards. Personally, I usually hate wedding videos and refuse to watch them. But I got into this one, it is the first one I’ve ever seen that I got in to–and that I have willingly, enthusiastically watched multiple times already: it felt like a rock video! I emailed Jaqui asking her, “who made this video? I need to meet them!” and she told me that it’s Paul and Melanie from Darlington Studios. This video is fantastic–I would unhesitantingly use them for my wedding, if I were to get married in Toronto. And be on the lookout for appearances of the Ketubah! Enjoy–and congrats to Alex, Jaqui, Paul, and Melanie. I’d just like to extend a thanks for all of your and your team’s hard work on our ketubah! It was gorgeous and we got so many compliments. I peeked at it and it looks amazing… It is so well wrapped it will travel perfectly to the wedding! …It is GORGEOUS. We love it! Can’t wait to show it off at the wedding. We got it in the mail yesterday- which was very cool because it was exactly 1 month til the wedding! Great timing! Thank you and the rest of this is not a ketubah… for everything!